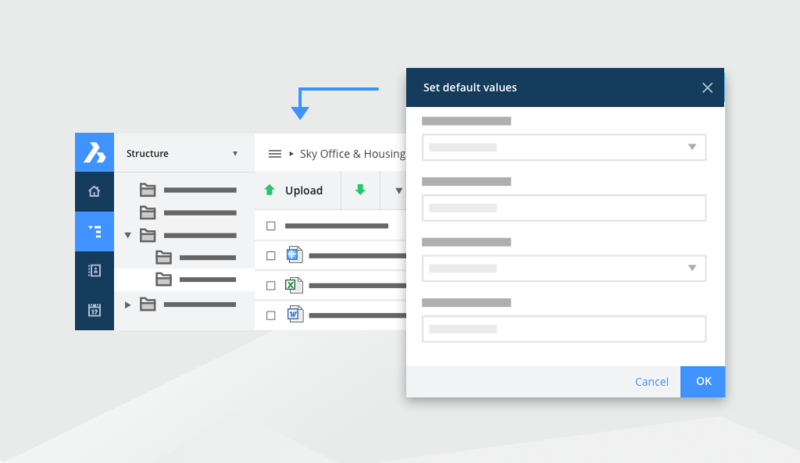 Administrators can pre-set the metadata that is associated to a folder in the Bricsys 24/7 cloud. Normally, every time a user uploads a file to Bricsys 24/7, you fill in pre-structured information – meta data – about the document. Then, select the document type, discipline and floor. Once the user has filled in the form and uploaded the file, a record of the form will be saved and attached to the document. Now the administrator can automate this process by creating a new folder with the meta data already included. How to set default metadata per folder? First, go to the Administration app. Then, click on Structure. Next, you can add an existing form to the chosen folder. You should have already created the form in the forms app. As a result, users can now upload files to the folder and the meta data is added automatically to the file. Use the advanced search of the filled in forms to find a document. For example: Search for Plan (Document type), Electrical (Discipline) of the third floor. This really comes in handy if you don’t know exactly where the plan is stored on Bricsys 24/7. You can search through the records of the filled in form in the Form Viewer. Optionally generate a name for the document based on the filled in form. As VP Marketing at Bricsys, I'm in charge of the marketing team, the corporate identity and the user interface of our products. I love photography, electronic music and I'm a petrol head.